Celebrate Valentine’s Day with Dunkin’ Donuts! 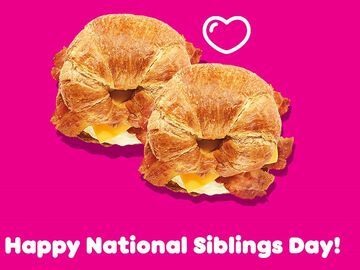 In honor of the wonderful holiday that is Valentine’s Day, Dunkin’ Donuts is celebrating with new, delicious menu items and sweet promotions to help keep our guests running. We’re spreading the love with our new heart-shaped Cookie Dough Donut and with the exciting return of the Brownie Batter Donut. We’re also hosting some fun promotions for our fans on our social media channels. Happy Valentine’s Day! Heart-shaped donuts are back! We’re introducing the new Cookie Dough Donut, featuring cookie-dough buttercream flavored filling, topped with chocolate icing and chocolate chips, and bringing back the Brownie Batter Donut, filled with chocolaty brownie batter flavored buttercream filling and topped with chocolate icing and heart sprinkles. 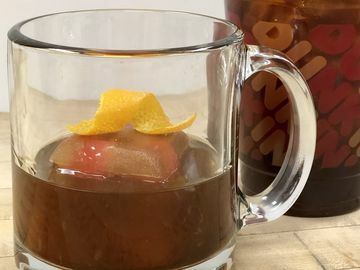 For a Valentine’s Day beverage for coffee lovers, Dunkin’ Donuts’ Brown Sugar Cinnamon Latte and Coffee, available hot or iced, is the perfect flavor pairing! Guests can use their Dunkin’ Mobile® App to share the Dunkin’ love with their special someone by purchasing a Valentine’s Day themed mGift. Simply go to the “Gift” toggle on your Dunkin’ Mobile® App, which is available for both iPhone® and Android™, and select one of the two fun holiday-themed mGifts, a monetary value and the delivery method – text, email or Facebook. You can even add a personalized message to make your mGift unique. 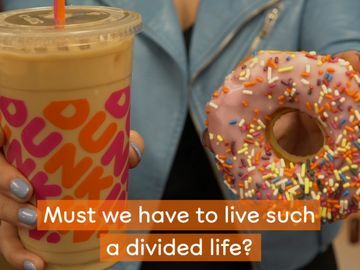 Dunkin’ Donuts has partnered with Zoosk, a leading online dating company and the #1 dating App in the iTunes Store, to make this holiday a little sweeter. Just like the perfect flavor pairing of our Brown Sugar Cinnamon Latte and Coffee, we’re offering a nice deal for anyone seeking their own perfect pairing. On February 13 and 14, people who register at Zoosk will have the chance to win a $5 Dunkin’ Donuts mGift to use on a coffee date. To be eligible, people must register here and can visit here for more information. • For an ideal first date, coffee is the winner over dinner: Exactly two-thirds (67%) of people said that having a casual conversation over coffee would be the ideal first date with someone they just met online. Going out to a fancy, romantic candle-lit dinner was a distant second at 24%. 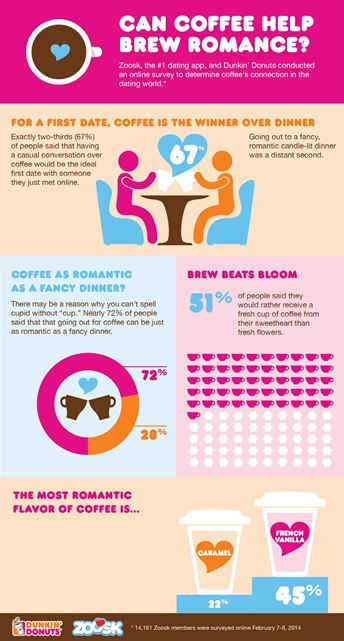 • Nearly 72% of people said that that going out for coffee can be just as romantic as a fancy dinner. • More than half of people (51%) said they would rather receive a fresh cup of coffee from their sweetheart than fresh flowers. • What is the most romantic flavor of coffee? French Vanilla was number one, followed by Caramel. 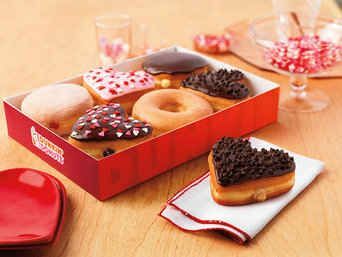 To help fans spread the love on Valentine's Day, Dunkin' Donuts is hosting a #DDHearts Valentine’s Day Twitter sweepstakes. From 8:00 a.m. - Noon on Valentine's Day, fans will be encouraged to tweet a special message for their own sweetheart, using the hashtag #DDHearts. 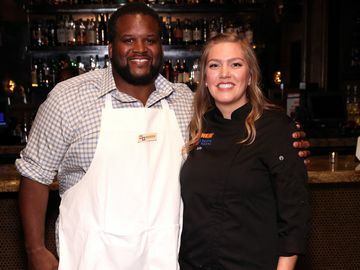 Fourteen participants will be selected to win a $20 mGift. 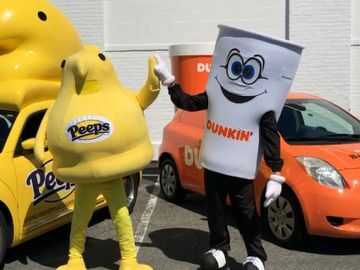 Up to ten participants will also have a chance to be selected for a special prize: a $100 mGift and a special video to send to their Valentine, featuring their own tweeted message and a heart-shaped donut, personalized with the name of their sweetheart and created by Rick Golden, Dunkin’ Donuts’ Manager of Donut Excellence. 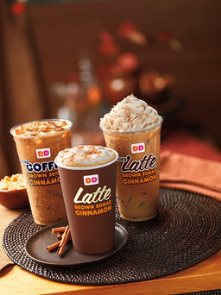 For additional terms and conditions related to Dunkin’ Donuts’ #DDHearts Twitter Sweepstakes, visit here. 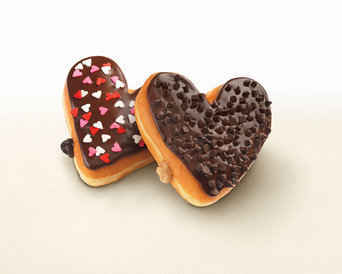 Happy Valentine’s Day from Dunkin’ Donuts!